Leogang is a village in the Pinzgau area of Salzburg. Leogang has a total population of approximately 3,000. It is situated between the Leoganger Steinberge and the Kitzbüheler Alpen by a river called Leoganger Ache. Leogang is an important skiing town and associated with Saalbach-Hinterglemm in the joint skiing destination "Skicircus". 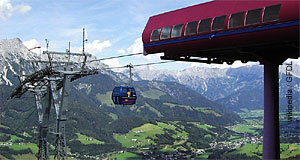 Together, the two (or rather three) communities form one of Austria′s busiest and most popular skiing areas. Ski lifts take hundred thousands (not exaggerated, it′s true) of skiers to sloped at altitudes between approximately 800 and 2,100 metres. Taken together, the skiing area of Skicircus Saalbach-Hinterglemm/Leogang has approximately 200 kilometres of slopes to offer, many of them can be maintained even at temperatures above 0 degrees centigrade - thanks to the armada of snow guns and artificial lakes that the area has built up over the past couple of years. Historically, Leogang is one of the oldest mining towns in the Alps. Its name was first mentioned in the early 10th century, but mining was already done here by Illyrian tribes. The local Bergbaumuseum or mining museum recalls the millennia of mining that kept Leogang going until the rise of skiing tourism after WWII. Since then, the village atmosphere that Leogang might have possessed once is pretty much gone. It is large hotels that dominate the area today. For sightseeing, note the parish church of Leogang, the Barbarastollen (a show mine) and the old Badhaus. The latter hosts an exhibition on Alfred Kubin, an Austrian artist that spent parts of his childhood in nearby Zell am See. For the summer months, Leogang faces the same issue as many other major ski towns: Overcapacities in its super-size hotels. In order to fight this, the community tries to promote "trendy" Alpine summer sports. Leogang wants to get beyond the "old-people-style" hiking and built race courses for "Downhill-, Freeride- and Dirt-Mountainbikers". Whatever that is, is seems to be much cooler than just walking up and down the mountains or scenic spots in the area - such as the Birnbachloch cave or the Grießener Moor, a swamp. Note that both Leogang and Saalbach-Hinterglemm target primarily a young and international audience. Both places are popular among British and Dutch visitors.